Feel rejuvenated in this bright, cheery, and elegant 2nd floor unit. Enjoy both sunny and stormy days and nights with a stunning view of the ocean and fireplace from the Master Bedroom and Living Room area. Watch the whales frolic and waves crash in the luxurious and comfortable leather furniture in the living room. 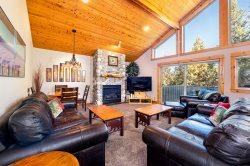 Relax by the beautiful river-rock gas fireplace in the living room and master bedroom. With a hint of European flair in this wonderful vacation getaway, The Lighthouse is the perfect spot for friends, family, or just for two. Very Nicely kept condo and amazing views of ocean and whales!! I was very pleased with the responsiveness of BPVR. We had an issue with the DVD player. The player was fixed the same day. Exceptional service! Great location. Beautiful view. Delightful, well maintainted and furnished condo. This is our second vacation at The Lighthouse and we have been very satisfied both times. Easy reservation process, easy access to the unit and straightforward checkout. Incredible views. Comfortable furnishings and very nice beds and linens. Beautiful place, great views and Whales!! The Blue Pacific staff was friendly, knowledgeable and responsive. The process of securing the unit was totally painless. The information provided was extremely useful and timely. Our stay was absolutely as close to perfect as you can get. We would definitely return with no hesitation. We travel quite often and always to ocean settings. We voted this property number one. Our Hawaiian experience dropped to number 2. The unit was absolutely fabulous. The location could not have been better. Watching the whales was total entertainment. We would most definitely book again. Property management team was extremely helpful and organized. The receptionist was super friendly and helpful when I had a couple check in questions. They were in the email, but had forgotten it at home. She was able to help me with no issues. Loved our weekend here and will definitely be back! The view was beautiful, didn't really notice we had neighbors so it was very relaxing.